When we began this adoption process, we discussed what religion we would raise our child(ren) and never really came up with a clear answer. It mostly leaned towards whatever religion they wanted and we are certainly willing to explore other religions that we are all comfortable with. I was raised Jewish… very lax, barely any Hebrew, public school, became a bat mitzvah at 13, confirmed at 16, worked at the temple in the kindergarten for several years and at a few Jewish summer camps, etc. Steve was raised Methodist by a fairly religious mother. These days, the only religion we have is that I work at a religious school and get the many holidays off. We don’t attend church or synagogue. We exchange gifts on the gift-giving holidays, but not much more. My family often forgets the holidays, I put up my little Christmas tree and sometimes remember to put the menorah up next to it. Though, to tell the truth, I can’t remember the last time I actually lit candles for 1 night let alone 8. As I mentioned, I work at a religious school – one of the several Jewish schools in the area. Since it is an Orthodox (the most strict) school, I was curious what would need to be done in the off chance that I actually wanted my child to attend. I don’t. Aside from the exorbitant prices, the education doesn’t seem that wonderful and I would much rather let me kids interact with children from all walks of life – every religion, background, upbringing – rather than just a small select group. The more I think about it, the happier I am with my child in a good public school. Anyhow, a boy or girl adopted child without a clear-cut parental lineage/ religion would need to be vouched for by an Orthodox Rabbi and given a Jewish name. A girl child needs to be “purified” and dunked in the mikvah – a ceremonial bath. A boy child, however, would need a circumcision if it wasn’t done as an infant. If it was, there would still be a ceremony in which needles and blood was involved. I’m going to have to go with a h-e-double hockey sticks no! on that one. Basically, we will not be converting our child to any religion until he tells us himself. I will even go to church, temple or other religious building if he wants to explore other religions. There is so much other stuff to think about and I know once he comes to live with us most of this won’t matter anyhow. 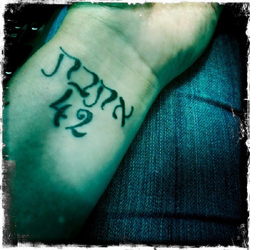 To the person that found me by searching “Jewish girl tattoo craft blog,” I think I love you. Seriously I am greatly amused by that strange mix of keywords. I actually believe that my new job will help a lot with my Jewish identity. I don’t really have one, if that makes sense. Sure I was raised, bat mitzvahed, confirmed, and volunteered in my family synagogue, but currently I feel no pull to Judaism. And I don’t think I’m alone in that. It seems many of similar aged friends are not drawn to religion. I have several atheist friends, as well. Religion is a funny thing. Who knows. It never really mattered to me to marry a Jewish man. In fact, my ex-fiance pretty much turned me off dating Jewish guys, so I guess there’s that. 😉 I always knew that, by definition, my birthed children would be Jewish. Now that we are planning on adoption and he is not Jewish (nor religious), my thoughts are thrown for a loop. We have discussed it, but didn’t come to a definitive conclusion. When you adopt older than infant children, I’m thinking you need to respect their religion. I could be wrong though.. But back to my job helping my Jewish identity. Obviously working for a Hebrew school, I will be exposed to much more religion than I’ve been exposed to in the last decade or so. Even during the trial run working there on my days off, I have noticed a change. I am conscious of the food I bring there (no ham, no cheese on my deli sandwiches), the way I dress (covering all my tattoos to the point of buying boots for my 3 ankle ink and wearing a chunky watch for the above wrist ink), less cursing (OK, well I’m around kids so that’s a given), and, well, I’m sure there is more. I’m looking forward to the other changes in myself. By the time this posts, I’ll have been at the Hebrew Academy for hours. Don’t I wish I was still warm in my bed? Yep! I love the Christmas season. I mean LOVE it. No, I don’t mean the December holidays season. I mean the Christmas season. Working at the YMCA and for a landscape company with a thriving Christmas tree decorating business certainly didn’t help this obsession. I love the music, decorations, trees, decorating the trees, decorating the house, cookie exchanges, Secret Santa’s, and the weather. OK, that last one is just the time of year and not Christmas specific. I don’t, however, care about the religious aspect of it. Jewish, remember? While I’m not a practicing Jew-girl and haven’t set foot into a synagogue since my cousin’s Bar Mitzvah several years ago, I’m still not quite ready to give up my Jewish identity. And no, having 7 tattoos doesn’t make a difference in that aspect. Sure, I married a non-Jewish guy who technically celebrates Christmas, it was never important to him growing up. Pretty much how I feel about Chanukkah. I almost always forget to take my menorah out of my Christmas ornaments box (not kidding) and even when I do, I maybe light 3 days of candles maximum. And, my Christian friends usually have to tell me when Chanukkah is. Pretty bad, huh? By the same token, we have discussed our children’s religious upbringing and haven’t decided exactly how it’ll occur, but it will be open for them to choose. I am fascinated by other religions and cultures, why shouldn’t my children be as well? 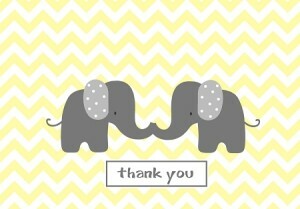 If you’re one of my Pinterest buddies, you’ve seen the boards I have for Holiday Decor and Holiday Gift Ideas. There are also a few ideas sprinkled into my Crafty Goodness board that I just haven’t edited and moved yet. So, I found this super cute tree during one of my many searches and decided to re-create it. I actually am quite pleased with how it turned out. 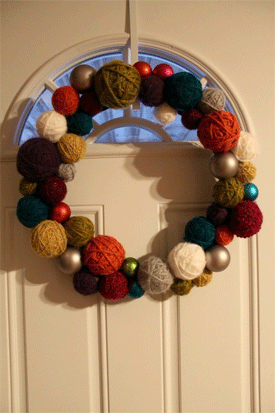 I also found some amazing DIY yarn wreaths and this was my choice to emulate. 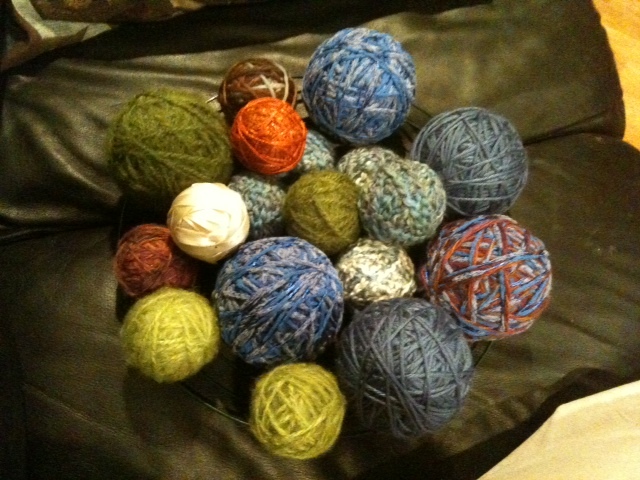 Lots of styrofoam balls of varying sizes, wrapped in scraps of yarn and stuck together. I bought a wire “wreath” and now just need to figure out the best way to attach my yarn covered styrofoam to it. 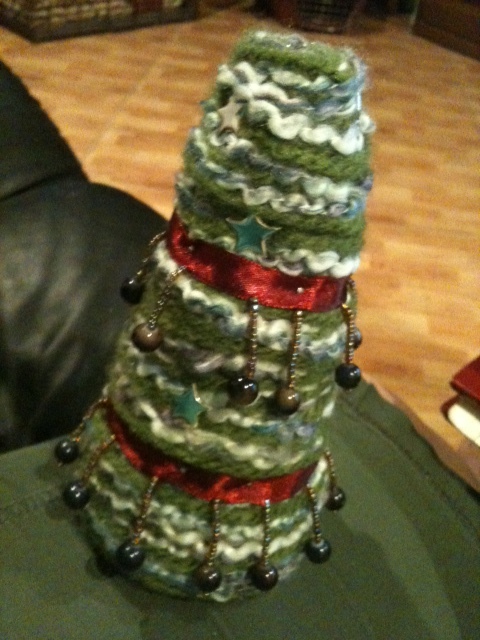 And mine… Any idea on how to attach it? 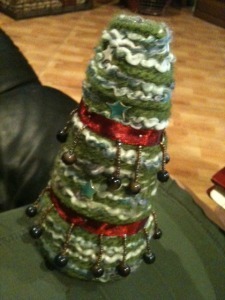 I pinned the yarn even though the directions suggest hot glue. Hot glue and my fingers don’t get along very well… I have 6 large and 12 small styrofoam balls. (I tried so hard to not use the word “balls” bc my 5 year old self is now giggling…) I also have small glass ornaments to use if I need to fill in more space. Ornament box, remember?